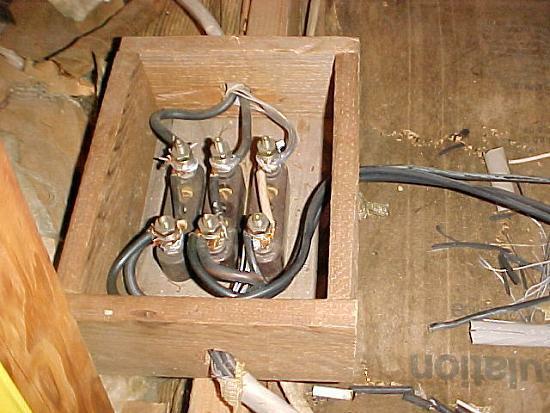 This "junction" box was in an attic of a house that I recently did a service change on. The oven wire, aluminum, was cut and tied to each side of the lugs. There were two 12-2 wires each pulling 110v off of the splice. There was also three #8 THHN wires tapped in carrying 220v to a barn. No doubt in my mind that this was not an electrician that did this "work". WOW! It's as if it were described to someone over the telephone.... "So all the wires come into a box ya see..." The person thinks to themselves... 'A box?' "How do them wires get in there?" - "Well ya pop a hole in the side...."
I'm impressed by the use of the white jumper wire to identify the neutral. 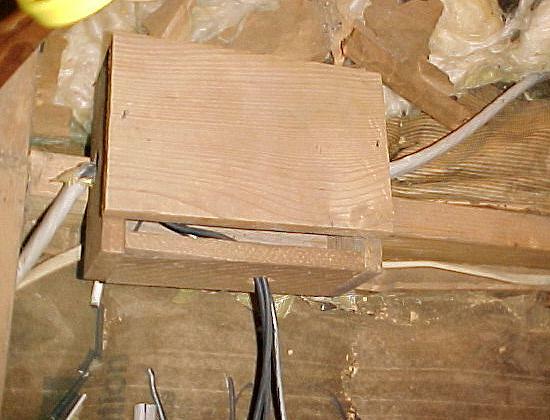 Question: How DO you clamp a cable to a wooden box anyway? No connectors or staples to secure cables? How the wires even stayed their. You'd almost think that them terminals had been stolen out of a motor. This is what you get when carpenters do electrical work. Actually, it looks like he used parts from an old telephone wiring block. I was thinking those blocks were from an older electric range, dryer, or simular kitchen appliance. If memory serves me right they are bussed internal to the bakelite mounting, and the jumpers are superfluous. (extra... sorry for the $5 word) Reguardless, the whole instalation is a bogus animation, and an un-realistic counterfeit. Sh*%, it's just Da*$ funny!